Not all your clothes need to be hung in your closet—some clothes, such as sweaters, actually benefit from being folded, as being hung stretches them out! Folding clothes is also a great way to save closet space. Fold shirts and socks efficiently. Fold the left and ride sides of the shirt toward the center. Then, tuck the sleeves in—you will now have a rectangle. 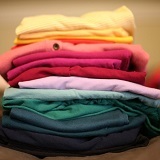 Fold the short ends of the rectangle toward each other in half or in thirds (whatever suits your closet/drawer best). For socks, follow the same method! For low-cut socks, fold them twice; for ankle socks, three times; and for knee socks and longer, four to six times. Fold stockings and tights efficiently. Lay the toes of your stockings/ends of your tights one on top of the other and fold the stockings in half lengthwise. You can fold it in thirds if the material is thin. Ensure that the toes are tucked in on the inside, then roll them toward the waistband. The waistband should be on the outside when you’re done.